Addis Ababa, October 30, 2011 (Addis Ababa) -Ethiopia said it has secured 753 million US dollars from the export of different commodities to abroad in the first quarter of this Ethiopian fiscal year, the Ministry of Trade said. The amount of foreign exchange earning in which the country got during the reported period exceeds that of last year same period by 189.6 million US dollars. The country has exported 275, 611 tons of agricultural products and commodities during the stated period to abroad. Coffee, cereals, oilseeds, live animals, gold and other mining products , kaht, flower and horticultural products were among the the export items in which the country exported to abroad during the reported period. Ethiopia has shipped its products mainly to Germany, Somalia, China, Sudan, Saudi Arabia, America, Japan and other middle east and European countries. Ato Abraham explained to online audience at gezategaru the latest directive from Tigrai national government in regard to city land lease holders who are late for more than five and half years to finish up their investment buildings. 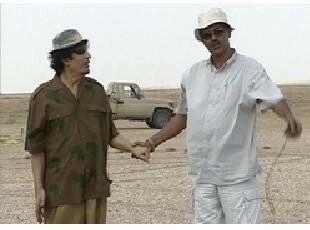 Gone but with lots of memory for his friends--Gadaffi walking along Eritrea shores! Behind the stock images of a region trapped in chaos and despair, economies are growing, reform is increasingly embraced, and governance is improving.Of course, no one should gainsay the importance of combating famine, piracy, and terrorist groups like the radical and murderous Al Shabaab. But, at the same time, we have seen my homeland, Somaliland, witness its third consecutive free, fair and contested presidential election. And Ethiopia has emerged as one of the world's fastest-growing economies, with GDP up 10.9 per cent year on year in 2010-2011. Ethiopian Diaspora in the UK raise 2 million Birr for Construction of the Grand Renaissance Dam. Eritrea's Afwerki asks to meet Security Council as the push for additional sanctions against Eritrea gathers strength! Tsegaye Tegenu October 27, 2011- The world�s 7 billionth baby will be born on 31 October 2011. Researchers, policymakers,governments, civil society and social medias are expressing their concern over the effects of an ever increasing number of people on the planet and the greater demand on food, healthcare,education and jobs. According to the recent report released by UNFPA. Western Double Standard in Fighting Terrorism:the case of the ONLF, OLF and Ginbot7. Song about our Jeganu Artists by promise keepers!